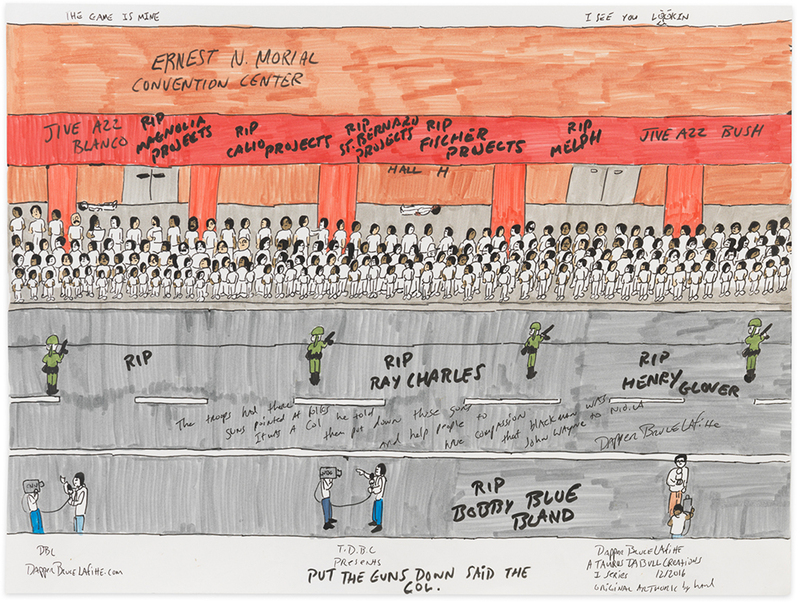 FIERMAN presents Kingpin of the Antpin: Artwork by Dapper Bruce Lafitte, a solo exhibition of new drawings by Dapper Bruce Lafitte, the artist formerly known as Bruce Davenport, Jr.
From 2006 through 2015 Bruce Davenport, Jr. depicted “the culture,” primarily that of New Orleans: the marching bands of public and parochial schools, Mardi Gras Indians, and street scenes. In the second decade of his career, Dapper Bruce Lafitte, as he is now known, is taking on “the history”: Civil War battle scenes, the civil rights movement, and, in this body of work, Hurricane Katrina. The storm that wracked New Orleans and exposed the federal government’s callous ineptitude also inspired Dapper Bruce to become an artist, and he confronts it in some of his most personal work to date. In drawings titled Exodus, No Love for the Poor, My First Time Seeing a M-16, and others, Dapper Bruce presents a visceral document of his experience in the immediate aftermath of the storm. Street scenes show floods of brown water, expressively drawn with marker; the Superdome is depicted as a yellow and gray monolith surrounded by stranded civilians. The crowds for which the Dapper is known are in these works fleeing rather than celebrating, confronting armed guards and walking along the highway away from the city. Dapper Bruce Lafitte was born and currently resides in New Orleans. A self-trained artist, he began making and showing work in the aftermath of Hurricane Katrina to commemorate the then decimated street culture of parades and marching bands of the city. He has exhibited locally, nationally, and internationally, notably in the Prospect Biennial, New Orleans; and in solo shows at the Ohr-O’Keefe Museum, Biloxi, MS; Vacant Gallery, Tokyo; Louis B. James Gallery, NY; and Atlanta Contemporary, curated by Daniel Fuller. Concurrent with the show at FIERMAN, Dapper Bruce will have a solo show at the Ohr-O’keefe Museum, Biloxi. His work has appeared in The New York Times, Harper’s, Victory Journal, among others. In 2009 he was a recipient of a Joan Mitchell Foundation Award.